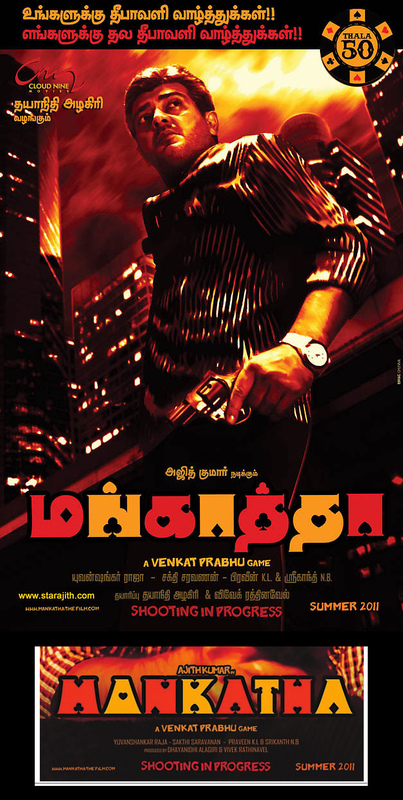 And now, for some 21st century stuff… I stumbled upon this nifty Tamil movie poster for upcoming film, Mankatha. Originally titled Mangaatha, after an Indian card game, the title treatment uses nifty little counter-cutouts in the shape of European playing card suits. I thought it was quite cool, and I dig the color scheme! I even really dig all of the secondary type. Nice job, whoever designed this! Below is the English-version of the titling treatment. The poster worked – now I want to see it! Plus, Ajith is in it, and he’s pretty cool.